as little of the air out of the egg whites as possible. out Cheetos-sized shapes onto cookie sheets lined with parchment paper. Bake for about 25 minutes, rotating the cookie sheets halfway through. Ta-Da!!!! 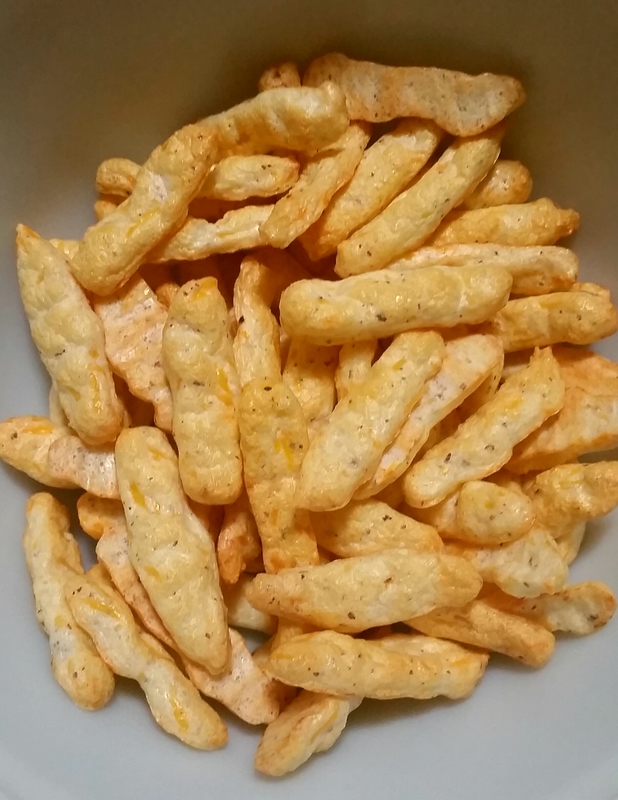 Now you have keto-friendly, guilt-free, delicious, satisfying cheatos!! Posted on January 8, 2017 March 22, 2019 by OregonKitchenPosted in Keto, Low CarbTagged healthy, Keto, keto chips, ketogenic, ketosis, lchf, Low Carb, protein, snack. Please tell me they don’t taste like egg. These look great! How many carbs do they have and for how many? You may have it posted, but I don’t know what the abbreviations mean. Would you please note them for those of us that are challenged in that area? I can only guess that F is fat, nC is net carbs and P is protein. Just a guess though! About how much in cups is 75g? I don’t have a food scale. You can just look at the nutrition label for the cheese you use. It usually says the serving size in cups and also lists the gram amount so you can find out how much to use that way! you could try a little hot sauce in the mix I bet, or sprinkle with cayenne pepper when they come out. I made these tonight. They were fun to make and fun to eat! Light and airy, very flavorful, I didn’t add the Parmesan cheese, but will try that next time. Hubby loved the crunch. Will find out tomorrow how they fare in the fridge overnight. When you state in the recipe 2T what does the T mean? Capital T always denotes tablespoon. T or “TBSP” is for Tablespoonful and the small “t” or “tsp” is teaspoonful. Hmmm….not sure why you had so much trouble. Your cheese should not accumulate a bunch of ice, however, during the freezing process…that may have been the issue. The egg whites will go down some when you add the cheese, but not completely. OHH!! I wonder how well some crumbled up bacon would taste in these!?! This is something I will absolutely try!! These are my absolute favourite Keto treats! I use Tex mex cheese and add the pinch of cayenne. Perfect when craving a nice crunchy treat! Thanks so much. They keep very well in the fridge. Have kept them for a few days with no issue. I bake mine until quite crisp as the first time I made them I found them to be a little chewy. Are these a “make and eat the same day” kind of snack, or do they store well. If storage, I noticed someone said in comments that they were going to see how they fared overnight in the fridge – but never replied how it worked. Can they be stored in pantry, and should I put a silica pouch (the kind that comes in vitamins, etc..to absorb moisture) in there with them? I just saw this recipe so have not made them yet. But since it’s an egg and cheese product I would think they need to be in the fridge. Of course, that’s just my opinion. I have no issue paying but how does one do that? Also again with the seasoning a little goes a long way, go light on each Cheeto and you’ll still have a lot of flavor. The pepper, citric acid, and sodium all amplify each other’s flavor. Make sure the powder is evenly mixed. I used a bullet blender myself but a grinder would work best. I paid. Payment went through my PayPal acct. Received a message saying a confirmation had been sent to my email acct. correct email address. Just sent it a few minutes ago. Check spam folder! Hmmm Not showing up. I’ve looked everywhere. Could you please try again? Same here, I paid your $1.00 thru Paypal for instructions to the recipe but nothing, no recipe. I emailed you but no reply. Do you check to see if your website is working properly? I would like the instructions please. It is not there. smithridgesuite@ is my Paypal username, not my normal email address. Your email is not in my smithridgesuite@ email, as I have just checked again. Please send the directions to h……p@live.com. Thank you. Your PayPal address is all my account receives and sends the recipe to. Please go to ‘ask the cook’ and give me your preferred email address and I will send the recipe again.